This link takes you to a companion site whose goal is to help you learn the night sky one bright star at a time. Use the Search box below to find doubles by popular name, RA, or telescope size. For example, a search on "15h" will find all doubles we've reported on that have an RA of 15 hours. A search for "60mm" will find all doubles where we used that size telescope. This is what Porrima and Saturn looked like on May 23rd, 2011, at 2300 PDT, when they were a little less than a degree apart. For data on the faint D, E, and F components, see below. Porrima! —- A name that conjures up images of dark nights spent at the eyepiece of a telescope trying to coax this most stunning of doubles into duality. The name itself is firmly imbedded in the lore of early Mediterranean and Chinese astronomy. 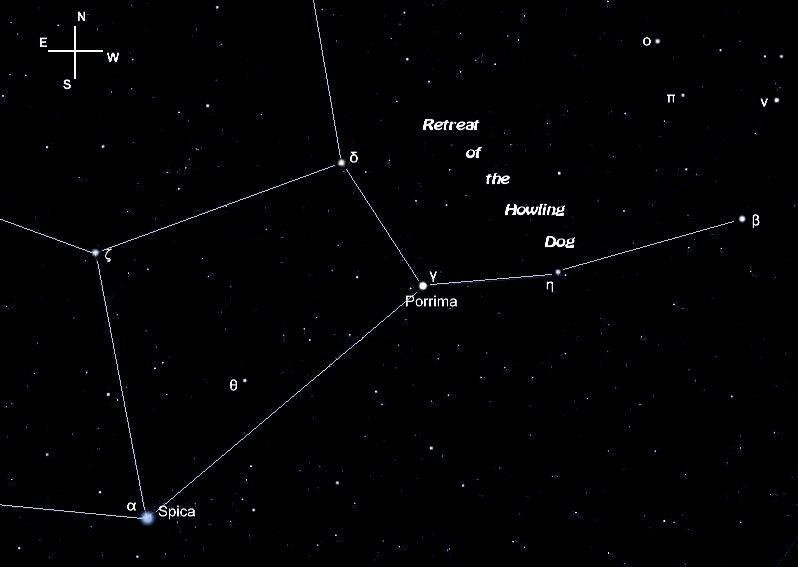 In volume three of Burnham’s Celestial Handbook (p. 2067), Robert Burnham writes that this star was named in honor of the “Goddess of Prophecy.” Other sources indicate there were two goddesses of prophecy who were twin sisters — which is a pretty darn good prophecy considering they had no way of knowing Porrima consisted of two twin-like stars. An excellent site that Greg came across for star lore is this one which contains excerpts from R. H. Allen’s Star Names — scroll halfway down to get to the section on Porrima. As Klaus, my four-legged observing companion would say: WOOF! But what Porrima really is …….. is two beautiful white globes with shimmering diffraction rings! Or, at least it is once you finally manage to pry it apart. Fortunately, that will become easier over the next few years because the two components are slowly getting further from one another, which this diagram shows rather well. It took me a couple of times on this warm June evening of 2010 — the seeing was not cooperating in the least — but when my efforts were finally rewarded with a clean split in a 102mm refractor, I was in awe of the sheer beauty. These two stars are virtually identical in size and brightness, so when you see their elongated form finally separate cleanly into two identical stars, it really is stunning. 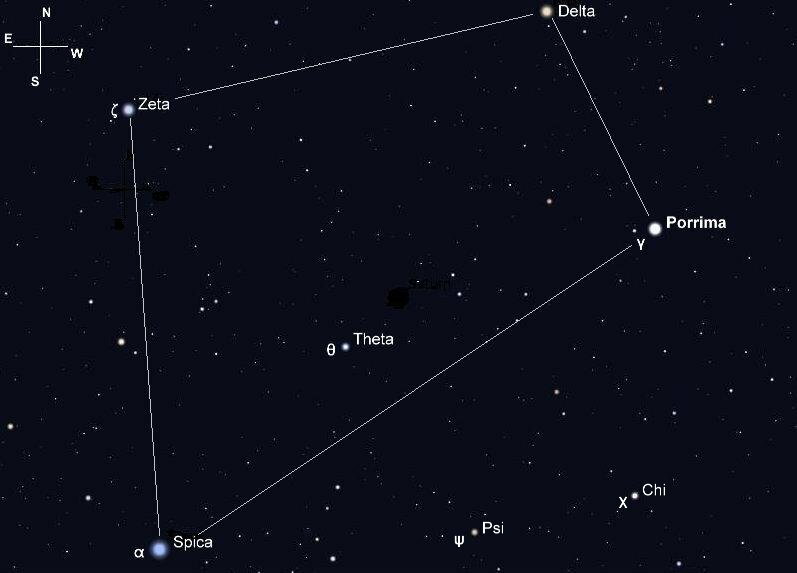 Located about fifteen degrees to the northwest of bluish-white first magnitude Spica, Porrima “A” and “B” are two of the fastest orbiting stars you’re likely to encounter. They orbit each other in 169 years, but because of the extreme elliptical shape — it ranges from five astronomical units (AU) to eighty-one AU’s — the separation between the two stars changes relatively quickly (see below for an orbital diagram). The good news, as I mentioned above, is they’re gradually drawing apart, so they’ll become easier to split in the nights and years ahead. At their closest, which was in 2007/2008, they were beyond the range of most scopes not housed in a large observatory. I was able to get another stunning view of this pair on June 5th, 2010, with a 152mm refractor in average seeing. In a 10mm eyepiece (122x) they were a stretched out oval of light; in a 9mm (136x), they were more defined, still touching, not quite separate yet; and with a 7.5mm eyepiece (163x), they were transformed into two distinct globes — pure, white, shimmering, fantastic — words just don’t quite describe it! You really have to see this for yourself! I had no problem seeing “E” and “F” in my five inch refractor, and I found “D” fairly quickly with averted vision — although once I found it, I could see it most of the time with direct vision. With a magnitude of 12.05, I expected it to be harder than it was. Fortunately, at 171″ it’s far enough away from Porrima “A” and “B” that it escapes most of the glare. (See the sketch above if you haven’t already). And that 15th magnitude “C” speck of light at the top of the list above? I don’t have anything large enough for that one, but I would guess it would take at least twelve inches or so of aperture to pick it out of the glare. The difference of about 12 magnitudes between “C” and “A” means “C” is 62,529 times dimmer (2.51 to the 12th power) than its brighter parent, although its distance of 93.7″ offsets some of the effect of the glare. So best of luck if you try for it — and by all means, post a comment if you happen to catch it! If you look again at the orbital diagram, you’ll see how quickly “B” is moving around the primary, which should make it a bit more clear as to why confusion can so easily arise with regard to correct information. Much of the information on Porrima conflicts even as to the date of periastron — which in plain language is when the two stars were at their closest. Kaler, for instance, cites 2005, as do some older Sky and Telescope references, but most other sources cite 2007/2008 as the correct date. Similar discrepancies exist for separation and position angle. The April, 2011, issue of Sky and Telescope has an excellent article on Porrima (pp. 56-57) which is the best source I’ve found so far for new information. That article puts the separation of the two stars at 1.7″ as of Spring of 2011, which is the figure I’ve used in the data at the beginning of this post. That article mentions the use of an adaptive optics technique known as speckle-interferometery for measuring the separation of multiple stars, which is a new and more precise method than anything that has been used in the past. BUT —- if you happen to have a bilfilar micrometer handy, don’t despair. Put it to work — you never know what you might find! If you haven’t looked at Porrima and Saturn yet this month, time’s a-wastin’ — better take a look soon before they drop low into the southwest and become difficult to see well through the thicker atmosphere. From my observing location, Porrima and Saturn are about an hour away from a large cluster of coastal pines that block the view to the west of them. It’s 10 PM before the light fades enough to see the two objects, and it’s not completely dark until 11 PM — and by then, the trees are tugging at them. As much as I hate to lose these two beautiful objects, they’ll be gone for all practical purposes in another few weeks. But they’re a stunning sight in a telescope — actually, rather stunning visually, too — and it’s been a real pleasure to have had the opportunity to see this stellar rendezvous. Right now — provided the atmosphere is cooperating — an 80mm to 85mm scope is about the minimum aperture you can use to pry apart the two bright components, and you’ll need something on the order of 240x or better. After Porrima makes its circuit around the sun later this summer and emerges on the other side, it will have widened a bit. Maybe next year it’ll be in reach of a 70mm scope — and in a few years as it widens further, no doubt a 60mm scope will be able to resolve it. Does that mean the challenge will be gone? Perhaps, but the beauty will always remain. LAST CALL! If you haven’t looked at Porrima and Saturn — get going! My first success with Porrima came April 24, 2010 which was first light for my Explore Scientific 127mm f/7.5 Air-Spaced Triplet ED Apo. There was a 10-day-old moon and better than average seeing -transparency was below average – and I concluded I was going to wear out the word “wow” – I was also well on my way to becoming a confirmed refractor addict. Having revealed the Double-double as I have never seen it before – and I’ve been taking joy in those stars for half a century – I cranked it up to 381X with a 2.5 Nagler and turned it to Porrima which had been frustrating me off and on for several months with different scopes of various sizes. I had recently failed to split it cleanly with a 8-inch SCT.. Here’s what I wrote then. Now compare that to John’s report and you can appreciate what he was able to do with a 152mm refractor – an achromat that I’m quite sure cost considerably less than my ES127 – and he was using just 163X – less than half what I needed. So I’m looking forward to catching Porrima again – and cheers to that widening gap! 08/08/11 I just got this beautiful pair last night w/ my12mm astrometric EP + a Barlow 2.5X at 487X, C925. Rho rang true @ 3.2″. But theta came out at 346. Could that be true? Which star are you referring to, Steve? Porrima? I didn’t catch your meaning the first time I read your comment — too many darn stars named Rho and Theta — but I gather you’re talking about position angle and separation. The figures posted for Porrima are current as of Spring of this year, so they’ve changed very little now – and the separation then was 1.7″. The PA was 44 degrees in 2010, so it’s changed, but not by more than a couple of degrees. Saw your other comment on the use of the astrometric eyepiece. I’ve tried both the Celestron and Meade versions (which are pretty much the same), and my experience was they would try the patience of a saint. A bifilar micrometer would be great, but its a bit beyond the budget I’m afraid. Thanks, John. I’ll try it again next time I go Up Top. Izar. will let you know what my celestron ed80 shows. Double, double, toil and trouble. regards,rich. Thanks Rich – look forward to hearing your report with the 80mm. I got a glance at Porrima the other morning – as I believe John did as well – right above Saturn. But I didn’t even attempt to split it because seeing was so poor. It should be a bit higher in your sky and I suspect the pre-dawn sky may make it a tad easier – cutting down the glare some. Should be interesting – it will get higher as the twilight brighten the background until… well, let us know! Rich – Thanks from me as well. Really glad to see this site is useful for other people! I suspect you can split this one with the 80mm if the seeing is very steady – that and a lot of magnification ought to do it! Well, it split. Just. nice clear sky but very poor seeing maybe only in that direction. Used Izar to check seeing and focus as my memory of the last time i split “most beautiful” is indelible.No chance. Worst view ever. went in desperation to mizar; got good focus and diffraction ring(s) and two round stars at 280x. Back to porrima, let it drift slowly in from right side of fov. went from an almost horizontal cylinder to two thin nearly vertical cylinders going through the centre. That happened 5 or six times ,2/3 seconds each time in 25 mins of wishful staring. Least worst view in burgess 6mm shoved v. quickly into shorty plus barlow 200x. I would take 50% cloud cover if the seeing was better. Good luck,rich. Congratulations Rich, not simply for splitting it unde those conditions and with, what I assume was the ED80. I just got in from a nice session with an LX-10 ( 8-inch SCT) and near the end I took a shot at Porrima through the trees. No luck. Oh, they were kissing, but no black sky between them. I tried 266X – but that pushed it too much. Best view tonight was at 200X and that wasn’t enough to split it under these conditions. I would put seeing at average. I split Rigel earlier with no problem at all – pretty nice, really. Porrima was nearly 30 degrees high, and in tree branches, but still – I have to conclude that seeing was worse in that direction at that time, then my earlier views of Rigel and other doubles. Thanks Greg, it was the ed80 which is now my only working scope. it is welded to an AZ4 mount which is the steadiest i`ve had. Your notes on the views through an 8″ SCT made me feel a little less unhappy about getting up at 5.30am. saturn was a big disappointment. Those fleeting glimpses of porrima will encourage me out again until i can see two ROUND stars. Maybe if it rains tonight and clears by 5 am the sky may be much steadier. i also checked on Rigel that evening and took 30 seconds to make out the tiny secondary. once i got it ,it stayed there despite all the fireworks around the primary. From your observations i would suggest the sky condition is the problem , not the SCT. My evening challenge is now Alnitak. Best of luck with Porrima; maybe those trees have to go! rich. Sure am glad you two are seeing something besides clouds! If there was one star in the sky for every inch of rain I’ve seen this month, the sky would be so crowded it would be one huge blur! Well, maybe not quite as bad as that. Hi John, sorry you`re getting drowned. my weather also now bad. You said somewhere that you also like using a long f/ratio 60mm and comparing the views . i started off with an f15 dept. store scope which my then wife to be presented to me on our 1st. christmas together. The f/ratio was the only thing good about it but i did split many doubles that were wider than the limits and i think Porrima was one of them. this was before the wall came down so i will try to get an updated sep. figure for that time to compare with the next 2/3 years. Hope you get a clear sky soon, rich. Thanks John, no Alnitak for me tonight. total cloud cover-a blurry moon and inout hazy Jupiter. something like your weather and what i tried to leave behind in the UK. Just maybe when it clears there could be a steady sky to play in. Sorry you are having a lousy month. The celestial mechanics with Porrima are unique for me . For a major double to go from no chance to yeeesss! in 5 years is a great picture of two binary stars changing position in their orbit now almost on a daily basis. To see part of the universe in action is a privilege. i am hoping to see every subsequent view just like a shadow transit on Jupiter. poetry in motion. and physics. regards, rich. Rich, I like your train of thought! Poetry in motion is a good way to describe it. You’ll be stunned when you finally get to see Porrima as the two ROUND stars you referred to. Between the reward for all the effort, and their sheer beauty, it’s ranks right there at the top of my list. The only other thing in the sky that comes close as far as beauty goes is Castor, which lacks the difficulty, but makes up for it in visual pleasure. I think Greg has that on his list to write up soon. ooops – you’re right – and I was just looking at it again last night. Thanks for the reminder, John – and yes, Rich we’re on the same frequency. Hard to explain the magic there to others, but I certainly share your feelings and I really like the idea of making a long-term project of Porrima. Thanks Greg. i also like to finish a viewing session with a few mins. on Castor trying different powers so am looking forward to your notes-no pressure! On Porrima i`m actually considering writing brief details in my Norton`s (sacrilege) as there is no indication that the sep. increases so much in so few years. Weather has gone south last couple of days. regards, rich. Porrima – I got first real split of the season this morning, but it still left something to be desired. It split at 200X using the 8-inch Celestron EdgeHD – however, it was much better at 266X. I was using a 7.5 Tak. But – and this is a huge but – there was still too much light spilling into the diffraction rings and dancing all around. It was like seeing two pearls caught in a candle flame. I could see the individual stars and black night between them, but there was light shimmering all around – over, under, and mostly beside them. Sometimes it settled down into what was clearly battling diffraction rings. But I, of course, wanted it to go away entirely. Maybe with a good refractor it would have? 3. The telescope size – too big for these conditions? 4. The telescope design – SCT? Still – it was better than any view I’ve had so far, in part because it’s now high enough to be out of the worst of the turbulence. Greg, Porrima has always been a difficult split for me because of how low it sits from my location (I’m at 45 degrees north), and it’s not much different at yours. On a night of better than average seeing, I would think most of the problem with the excess light would go away. On the other hand, eight inches may be too much aperture. Really hard to say, though, until you get some good seeing to find out. I love the two pearls caught in a candle flame – that really describes it well! I sure can visualize what it looked like from that description. I will say this about Porrima – it took me a long time to get the right night to split it, but it was one of the most satisfying feelings I’ve had behind a telescope, and the view of those two white pearls is still etched firmly in my memory. It`s getting visually wider; which is what i get from your latest report. Despite the lousy seeing the celestial mechanics are pushing in one direction almost on a daily timeframe. I just want to score before 1.1.2011. Unfortunately the entire northern hemisphere seems to be “enjoying” volatile weather. Porrima and Alnitak both recently gave me the Boiling Bubbles-the former at 6 AM and the latter 8 hours earlier. At least i got another definite split of Izar, if not a great view. On your specific questions despite having zilch appropiate qualifications i would suggest putting a thick ring around ” No. 2″. On the same point i thought you frequently used a 127mm APO?? The reason i remember re-reading your post soon after you got it was simply because that scope would just be “IT” for me. Unfortunately 5 doorways and 6 flights of stairs dictate otherwise. For now. Anyway “P” in two ways is getting easier-6AM or even later is OK – ( hell i`m not going to WORK ); and as you said- its higher! regards and good luck, rich. Man, this is like pulling teeth – pearly whites,that is! I’m getting there, This morning I had my best split yet using an old 8-inch SCT (Meade LX-10) and a 5mm Tak Le – yeah, that’s 400X and was really pushing it for those conditions – but it worked. What I had was a relatively clean battle of diffraction rings with enough space between the two stars to fit a third star the same size. However – this is why I don’t put a whole lot of faith in such “tests.” Perhaps when I put the Orion in I just had better seeing? It certainly was variable. Still, this is one more thing that makes me feel observing experience, the observer’s condition (well rested? ), and most of all, sky conditions, are a much greater determinant of what you see than various expensive equipment choices. Congratulations Greg, and a belated Happy New Year! One of these mornings things will be just right. This morning wasn’t it, but it was fun. I was using the 76mm Tasco with a focal length of 1200mm and under poor seeing I did get a split with a 12.5mm Plossl (96X). Just to be sure, I made a drawing showing the two ninth magnitude companions and the relation of the split to these. Yep – all the PAs check out. I say “to be sure” because there was so much flaring going on and light appearing to jump into one area of the diffraction rings that I thought what I was seeing might be a defect in objective or eyepiece. But it wasn’t. I cranked up the power using the magical 7.5mm Celestron Plossl and a 6mm Celestron Plossl. That gave me 160X and 200X respectively. I’m sure the scope can handle 160X and I suspect it can be pushed to 200X, but neither were any good under these seeing conditions. Again, I had a split, but with so much flaring between the stars I could not be positive. Porrima continues to dance with her partner and won’t let me cut in! I thought this morning would be different. She was just past the meridian and thus about as high in my sky as she gets. I was using a 76/1200 Tasco and this venerable scope delivered a fine view of Saturn at 120X with a 10mm Tak LE, so I thought the seeing was above average – though I admit, I still can not see Cassini’s Division – guess the ring have to tilt a bit more, I have to use more scope. But it was no go with Porrima – not with the 10mm, a 7.5mm or 5mm Tak – nor with the “magic” 7.5mm Celestron of the orange lettering. Ah well – if nothing else I’m showing that success in star splitting takes persistence and my hands, despite making nearly 70 trips around the Sun, can still take the 22° F temps! (Yeah – I take my gloves off a lot – especially when I’m taking photographs, as I was doing this morning – photographs of the Observatory and 76mm on its T-Mount. Ah Porrima, at last we dance! I thought perhaps yesterday would be it. Skies were clear and steady. I tried the 8-inch Edge HD and got a solid split – but still had battling diffraction rings. It just wasn’t there. Close – but not satisfactory. Then, just a half hour ago, I sat down on the deck in 25-degree F temps with the ETX90 – a little scope that is impressing me more and more as a junior star splitter supreme. Wow! At 250X ( a 5mm Nagler) I had the cleanest split yet, Two perfect white globes with interlocked, but not battling, diffraction rings.! And it got better. I switched to the 6-3 Nagler zoom. Clean split at 6 – better yet at 5 – better than the 5mm Nagler. Then I went to 4 (312X) – incredibly perfect – just what I have been striving for – what I knew would be there some night. I jumped to 3 – 416X – ridiculous, but for a moment I think it was there. The scope, however, was on the Voyager alt-az and the moment was fleeting as Porrima drifted out of view. In getting it back I knocked the focus and by the time I refocused, it wasn’t there. That is, the split was fuzzy at 416X – as anyone would reasonably expect. And when I backed down to 5 and even 6 it was still not up to previous standards. Nice – but not perfect. I take that as a testimony to how quickly seeing can change. Before I looked at Porrima I checked the seeing by splitting Polaris at 250X – and it was not great – about average, I would say. I got the split, but Polaris could have been sharper. Still, I tried Porrima – in an entirely different section of sky,of course, and got the excellent results reported. For my money this also says something about the size of scope and star splitting. And for this task it seems clear that larger scopes simply demand better conditions – they don’t offer a real advantage. They are gathering more light and – of course – their light gathering power increases much more rapidly than their resolution. So it makes a crude kind of sense to me that they would demand better conditions to produce the same results on the same target – especially when light isn’t an issue. That is, when we are dealing with a pair of very bright stars, such as Porrima. Meade lists the resolving power of the ETX90 as 1.3 seconds of arc – Porrima is split now by about 1.4 – so the little dude is nearly maxed out. Before going in I made a quick check on Saturn. Nice, but it couldn’t take the power Porrima demanded. At 166X it was acceptable. If I was really going to spend time with it, though, I would have backed off to 125X. Still having trouble getting a good view of the Cassini Division. Curious sight tonight, though, for there were two bright (relatively) stars right where two Moons should be – ahhh – just checked – that was Titan (8.43) and a star, (8.15) just 55 seconds apart and right on a line with Saturn’s equator where you would expect to find moons! very beautiful with just a hair between them. Great! Congratulations. Glad to hear it’s now in range of an 80mm – albeit a very good one! Last night at the summit, 10,000 ft. elevation, I split Porrima AGAIN with my Celestron 925 using my Meade Astrometric 12mm + 2.5 Barlow at 487X. I still get a P.A. of 340º, (on the 7th I got a P.A. of 346º). If I flip the scale, that’s a P.A. of 20º. Seeing was good, although not totally dark. Humidity was 50%. Well, we have another one-tenth of a second in the split (1.8″) and while Porrima is still low in the morning sky. i was able to get a clean, hairline split with the TV85 and a 2.5mm Nagler – 238X. I didn’t try less because I was using a C6 SCT on the same mount and had found I needed a 7mm (214X) to get a fuzzy hairline split with it. The split in the TV85 was as good as I can remember, so I’m looking forward to when it gets higher in the sky – I think this year it may really comes into its own, at least for me. Up until now it has always been a challenge and the splits satisfying from the perspective of achieving them at all, but not the kind of magic I expect from these two, bright, perfectly matched stars. Congratulations,Greg. V glad your pre=dawn patrol paid off. Lovely bit of kit to use as well. A TV 85 punching more than its weight. Regards, rich. * I could get a hairline split of Porrima using the highest power on the TV85 – I imagine tis was up around 150X. * I could get a perfect, clean split using the C6 and some power in the neighborhood of 200X. That second view with the C6 was mesmerizing – as good as I’ve seen Porrima yet and since seeing was marginally above average – maybe a 4 – I was pretty happy with the result. I may have achieved this with the 20mm TV Plossls on their highest power – I do know that’s what I used when I split the Double Double later in morning twilight. Nice split there as well and by my calculations that was 128X. There’s a way to make precise calculations on the power, but there are so many variables with the binoviewer that it’s not easy. For now I am happy just to get everything working as advertised. I did use the 9mm Zhummels on Porrima I’m quite sure – I just can’t remember which setting of the Power switch gave me the satisfying split with them. In any even, not bad for a pair of Plossls I bought on a whim for $15 each off AMart! Got it! My first split of Porrima this season! And I did it with my ninety-five dollar Orion 90mm f/10 refractor, too! If you’ve ever wondered about how much money you need to spend on a telescope to enjoy this endeavor, this one is living proof that it can be done very economically. I was forced out onto my driveway this morning because my usual observing spot — my second story deck — was covered with a thin coat of very shiny and slippery ice. When that happens, I’m restricted to small aperture, light-weight telescopes and mounts since they have to be carried down a flight of stairs — which isn’t too tough — and then back up — which isn’t the least bit easy. So I grabbed the Orion 90mm and an old Polaris mount that doubles as both an equatorial and an alt-az. The alt-az part is important since I can’t see Polaris from the driveway. After letting the scope cool for long enough to get acquainted with the thirty-five degree air, I checked it on Saturn, liked what I saw, and then strolled up to Porrima with it. A 20mm TV Plössl (46x) showed definite signs of the stars pulling apart, so I immediately put it on steroids by inserting it into a 2.4x Barlow — 110x — and found myself looking at a very dazzling white figure eight. FAN–tas-tic! I swapped the 20mm out for a 15mm TV Plössl (146x) and could see a slight bit of separation when the uncertain seeing wasn’t driving the two stars back together, so I traded the 15mm for an 11mm Plössl of the same vintage — and it’s 198x did the trick. Both stars were distinctly separated in the nervous seeing, and every now and then, I could see quivering diffraction rings surrounding each star — almost like two bulls’ eyes at the center of a target with the outer surroundings of circles. I suspect Porrima is approaching two arc-seconds of separation this spring, so it really is well within reach of a 90mm scope — in fact, I came very close to getting the figure-8 effect a few weeks ago with a 60mm f/16.7 refractor. BUT — that el-cheapo ninety-five buck scope delivered as much enjoyment this morning as my 90mm APO. If you measured it in terms of pulsating thrills per dollar, the Orion comes out way ahead and, with a few bucks left over to buy a good Barlow! My congratulations, also. Have had good views recently of Porrima-last night being one. Just for a change FINDING it aganst the almost full moon took more effort than getting a great view of two round globes. The seeing just about allowed 170X and 200X in the ED 80. Interestingly ( and seen before) there was one diff. ring around both stars. Each side was a normal half-circle, the top almost invisible, and below an nearly straight line joining the two half-circles. BTW, when binary two stars are equal, what is the rule to decde which is the primary ? Suspect my recorded PA has been 180 degrees out! From that we can see that the primary is the star to the south. Knowing that, do you see a difference in brightness? I’ll have to look again just for that – which is good. I love having an excuse to revisit these stars! Thanks Greg for the detailed info. Will check if i can see any difference in their apparent mags. Probably the full moon will be smack in the way. The dibonsmith site is also now for me a handy ref. for future “equal doubles” as well as Porrima. His diagram is for a reflector but having the benefit of your “directions in the sky” i can see why you start with 16 degrees. Any how i will use the one to the south as the primary and try to get a good guess on the PA. Maybe soon i`ll get two diff rings like i always do with Castor. Another reason to examine that beauty. Clear skies, rich. I’ve been watching the separation of Porrima widen gradually for the past few years, waiting for a chance to split it with a 60mm scope. An attempt late last year didn’t quite get there, so I’ve been waiting patiently for another shot at it this year. With it’s current separation of 1.95″, it’s right at the Dawes’ limit of resolution for a 60mm, which is 1.93″ to be precise. I just happened to have a 60mm refractor equipped with an f/16.7 Carton lens riding on the top of my D&G five inch f/15 refractor — and the D&G was doing a fantastic job on Porrima at 318x — so I decided to give it a shot. I started with a 12.5mm Astro-Tech High Grade Plössl (same as the Sterlings) that gave me 80x and could see a definite elongation. Next move up was to a 6mm Plössl of the same brand (167x) and I found myself looking at a well defined figure-8 image — progress! I thought a few minutes about what to try next, and decided on the 6mm’s little brother, the 4mm AT Plössl, which yields a rather extreme 250x experience for a 60mm refractor — and it has a lens about half the diameter of a pin-hole. Fortunately I was using a driven EQ mount, so at least I didn’t have to chase the image as it raced across the field of view. That kind of thing can turn an effort like this into sheer torture. In it went — and out of that mini-pin-hole-of-a-lens emerged two distinct and very round globes of white light! When they weren’t jumping all over the place, that is, or popping out of focus thanks to erratic seeing. The seeing had been an irritant all night, but it was tolerable until I reached 250x in the 60mm scope. But when it settled down for a few tenths of a second at a time, the stars were distinct as could be. I may have caught a few glimpses of a very thin black slice of interstellar space between the two stars, but they would never hold still long enough to be completely positive about it. 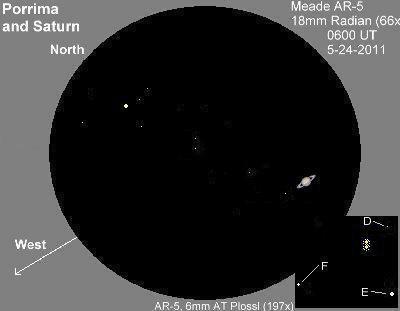 So here’s a challenge for the next several months — grab a 60mm refractor and go for it! It’s definitely within reach this year! T mount to see if I could split Porrima with it. Using a 10mm ortho. there was a definite figure 8 and for brief moments two seperate discs. I believe if I had a 4mm eyepiece it would have split clean. good it is in some ways better than the AS80 I will have to use it more. Ah – congratulations and thanks for the reminder – I haven’t looked for a year. I really love watching Porrima – not simply because it’s beautiful, but because it changes quickly enough for us to appreciate what’s going on. If I get a steady night I’ll give the 50mm Tasco a try at it. Your experience pretty much matches mine, Pat. I’ve tried the last two nights with a 60mm f/15 and haven’t done any better because of poor seeing. I have no doubts the Telementor will split Porrima on a calm night, and 4mm, which would be 210x in that scope, should do it. Actually I plan to enjoy it with the Renaissance – but I’ll try the 50 just to see what I can detect. It’ll roll over and throw up both hands to the Renaissance! You should be able to get a definite figure-8 image in the 50mm if the seeing is stable. The last four nights here have been clear, but the seeing has been in the I and II categories — a combination of high frequency hopping and sometimes just enough moisture to cause a smeared image at higher powers. Rather frustrating to get a long period of clear skies and poor seeing, but it beats the past four mounts of clouds and rain. It’s a real pleasure, though, to see that figure-8 shape develop in a 60mm scope and then to suddenly see two distinct globes. It was only a few years ago that it was a struggle in a four inch scope. mauistargazer on Castor – three steps to take you from aw to awe! John Nanson on And now for something totally different — a Refractor Review! Dave on And now for something totally different — a Refractor Review! Daniel on First light for Jason 313 – and it’s a winner! Greg Stone on First light for Jason 313 – and it’s a winner! Peter Ugarte on First light for Jason 313 – and it’s a winner!